George Henry Gould was born in Yeovil in 1859 and baptised at Holy Trinity church on 4 December 1859. He was the son of glover James Templeman Gould (1836-1914) and his wife Sophia, known as Sophy (1835-1872). In the 1861 census George was recorded living in Rotten Row (today's Market Street) with his parents and two older sisters, Kate and Eliza. 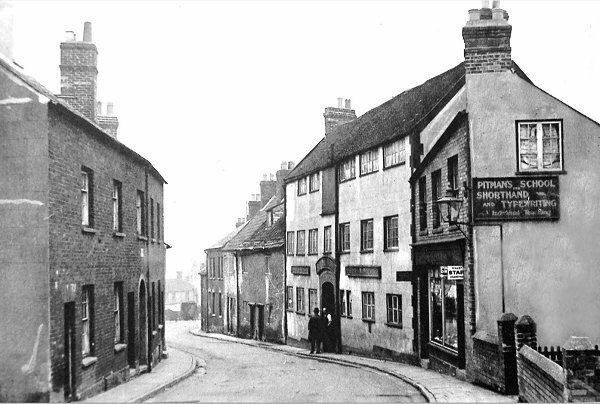 In 1871 the family were listed living in Reckleford (although this was, in fact, still today's Market Street and not to be confused with today's Reckleford) and two new daughters were added to the family, Beatrice and Elizabeth. In the winter of 1880, at the age of 20, George married 19-year-old Yeovil-born Martha Trask, the daughter of blacksmith Samuel Trask (1819-1901) and Emma née Tregay (1822-1914). George and Martha had no children. In the 1881 census George and Martha were living at 2 Wyndham Street and George listed his occupation as a leather dresser and Sophy gave hers as a glover. By the following year George had become a partner in the glove manufacturing company of Ewens, Gould & Allen (only listed in Kelly's trade directories between 1889 and 1894); the three partners being Edward Samuel Ewens, George Henry Gould & George Richard Allen. The Ewens, Gould & Allen factory, in South Street, was a three-storey, seven-bay building and is photographed below. 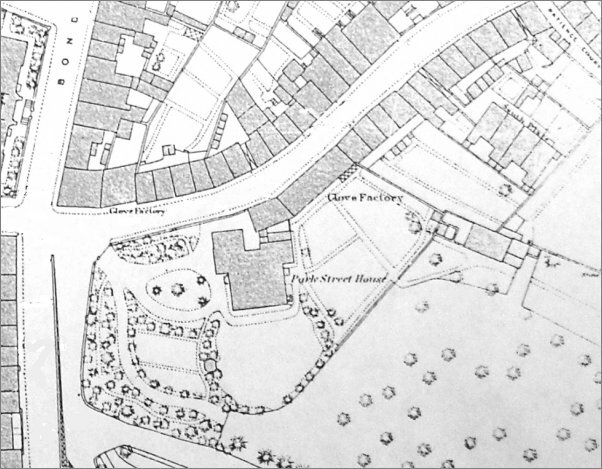 As seen on the map below the glove factory was almost integral with Park Street House which had been the home of glove manufacturer William Fooks. Ewens, Gould & Allen purchased the factory and house by auction in 1882. By the time of the 1891 census George and Martha had moved to 5 Mill Lane, where they were listed living with George's 3-year old niece, Violet Davis, together with a domestic servant. At this time George gave his occupation as Glove Manufacturer. In its edition of 19 April 1895 the Western Gazette reported the dissolution of the Ewens, Gould & Allen partnership, the business to be thereafter known as Ewens & Gould. However, within a few years it appears that Ewens & Gould left the South Street premises and the glove factory and adjoining Park Street House were bought by Ebenezer Pittard. Ewens & Gould, in the meantime, relocated to premises in Vicarage Street. However, and as published in the London Gazette edition of 17 December 1897 (see below), on 1 December 1897 the partnership of Ewens & Gould was dissolved, with George Gould continuing the business on his own. His glove factory and dressing yard were on the north side of Vicarage Street off the bend in the road at its eastern end and its rear overlooked the rear of houses in Earle Street. The premises were formerly those of William Raymond and are shown below on both the map and the aerial photograph. In the 1901 census George and Martha were listed living at 131 Sherborne Road together with a general domestic servant. George listed his occupation as a Glove Manufacturer. They were at the same address, listed as Hill Side House, in 1911. Whitby's Yeovil Almanack Advertiser of 1903 listed George Henry Gould as a 'Glove Manufacturer of Vicarage Street' which was repeated in Collins' Yeovil Directory of 1907. 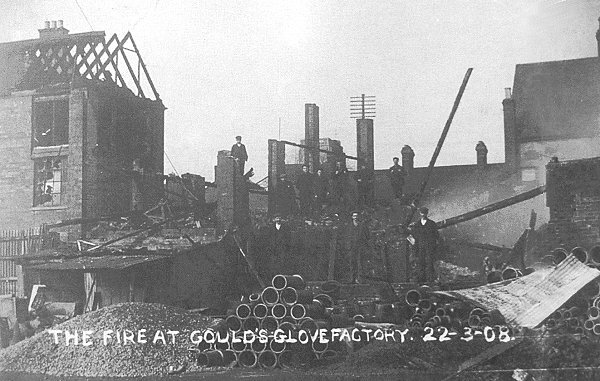 About 4 o'clock in the morning of Sunday 22 March 1908, a blaze started in the dressing yard behind the glove factory. As seen in the photograph below much damage was done, estimated at some £4,000 (somewhere in excess of £400,000 at today's value). The glove factory and dressing yard were rebuilt. During the late 1890s / early 1900s George became involved in local politics. 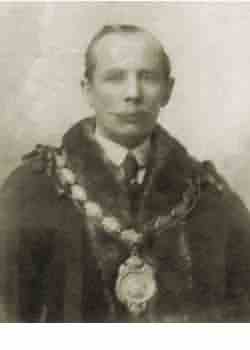 By 1905 he was an Alderman and was later elected Mayor of Yeovil for the term 1917-18. In the 1911 census George and Martha, together with a servant, were still at 131 Sherborne Road, a large house with ten rooms known as Hill Side House. George still listed his occupation as a leather glove manufacturer. George Gould was still being listed as a glove manufacturer of Vicarage Street as late as Kelly's Directory of 1919 (not to be confused with the George Gould who was listed in the same directory as licensee of the Globe & Crown in South Street). After he retired, George and Martha moved to 'Wavecrest', 8 Percy Road, Boscombe, Hampshire, just outside Bournemouth. The glove factory and the large yard at centre bottom later became the Council's 'Town Yard' during the 1970s and 1980s. George died on 27 May 1935 at the Strathallan Nursing Home, Boscombe. He was aged 75. His will was published in September 1935 and his effects amounted to £65,559 (about £16 million at today's value). Martha died in the spring of 1945 at Boscombe, aged 84. This map, based on the 1886 Ordnance Survey, shows South Street running across the top of the map from its junction with Bond Street and Park Street / Addlewell Lane at left. Ewens & Gould's factory is shown at centre. The glove factory shown close to Bond Street was that of Clothier, Hitchcock & Giles. Park Street House, at centre, became the home of glove manufacturer Ebenezer Pittard in the 1890s. 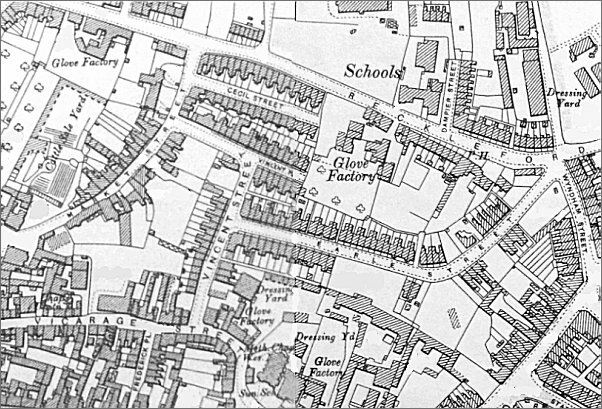 Map based on the 1901 Ordnance Survey showing George Gould's glove factory and dressing yard just left of centre bottom, above the 'STREET' of Vicarage Street. The record of George's baptism from the Holy Trinity parish register. This photograph of South Street dates to about 1920. The three-storey white building at centre was the Ewens & Gould glove factory. The building at right with a shop-front and the Pitman's School sign was originally the Park Street House gardener's cottage. The factory later became a box-making factory and, later still, the site was cleared and it was occupied by the Somerset & Dorset Box Co Ltd. The site is now the car park behind the old Gaumont cinema. The Notice place in the London Gazette of 17 December 1897 dissolving the partnership between Edward Ewens and George Gould. On 22 March 1908 fire started in the dressing yard behind the Vicarage Street glove factory, mostly destroying both yard and factory and causing an estimated £4,000 of damage. This aerial photograph of the 1920s shows the eastern end of Vicarage Street snaking across the photograph from its junction with Middle Street, seen at the very top left corner. 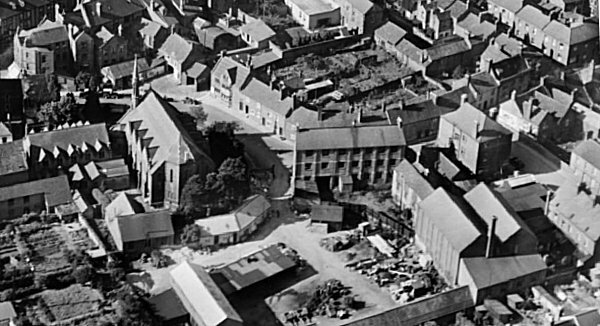 At left the Methodist church dominates and just right of centre is the three-storey glove factory of William Raymond, later the factory of George Gould but it burnt down in 1908 and this photograph shows the rebuilt glove factory and dressing yard. The glove factory and the large yard at centre bottom was the Council's 'Town Yard' during the 1970s and 1980s - I spent many hours in that building during those years, usually talking with the Highways Manager, Ralph Tucker, who sadly passed away at Christmas 2014. George's mayoral photograph. 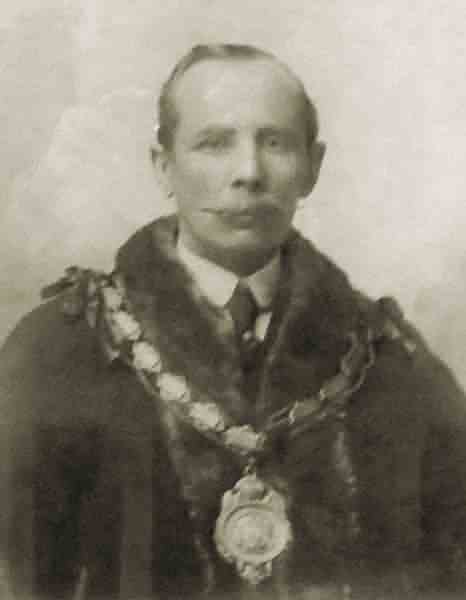 He was Mayor of Yeovil during 1917 - 1918.